A bonus feature for a 3 player gaming machine we were doing. 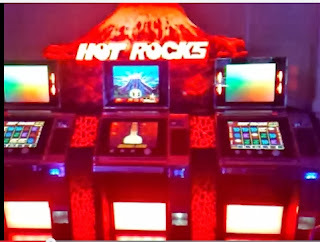 All the machines are linked with a proprietary bus which allows them to synchronise the effects, and the volcano has an Ethernet connection to all 3 machines so any one can start the bonus. The lighting effects are all written in Pawn scripting language, and uploaded to the lighting controller at the start of each session. Looked good, but we never put it into production.